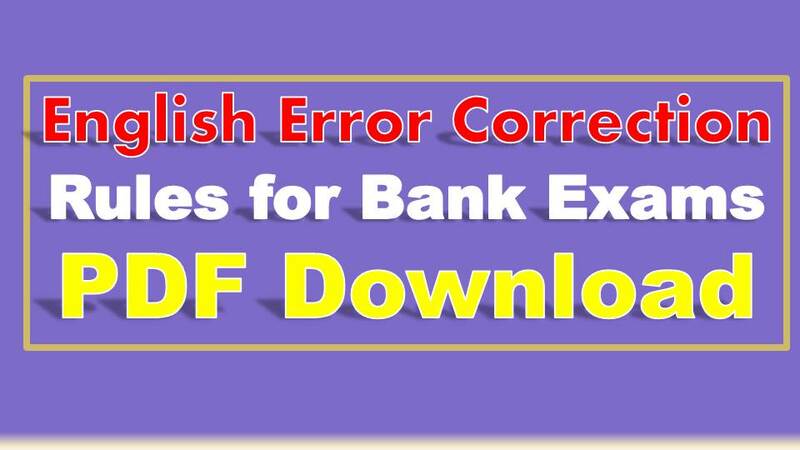 English Error Correction Rules for Bank Exams PDF: Hi friends English Languages is the most important subject in the all competitive exams like as SSC CGL, SSC CHSL, Railway, SSC CPO, Railway NTPS, IBPS PO, IBPS Clerk, RRB, RBI and LIC Exams. Now a Days Any Competitive Exam Conducted by The State And Central Government recruitment Board English Language Is the Most Important Topics What are the Topics are in the English what we are doing mistake in the Exams? Below this post we provide the 100 English grammar rules PDF Files Download Free of Cost. The syllabus for the General English For Competitive Exams are given in Tabular Format below. 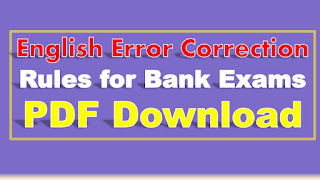 The spotting errors in English for bank exams pdf file are taken from the qmaths short notes. That credit goes those. This article gives the some English error correction exercises with answers useful for the Bank and SSC Exams. 1. If two singular nous are refer same person or thing the verb must be singular. Right: The Secretary and Principle is coming. (Here both are same persons). 2. Know is followed by how/where when/ why and infinity. Wrong: I know to write a letter. Right: I know how to write a letter. 3. Every participle must have a subject Reference. Wrong: Being a Rainy Day Vijay decided to stay at home. Right: It being a rainy day Vijay decided to stay at home. 4. Gerund must if preceded by a pro noun that pronoun must be possessive case. Wrong: He emphasized me going to their. Right: He emphasized my going to their. 5. Latter, latest refer to time, latter and last refer to position. Wrong: I reached at 10 A.M but he was latter than I expected. Right: I reached at 10 A.M but he was later than I expected.